This pub closed down some time ago and is derelict. Naughty, very naughty. Some nasty characters in here. London Pride & Green King IPA, the former was barely drinkable. 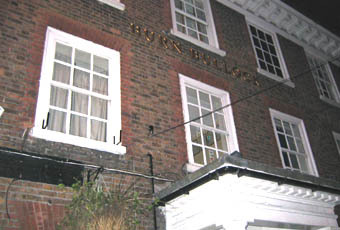 The Burn Bullock reopened on Friday 8th October under new management. The new landlady, Sue, has to be handed a large award for getting the doors open and the pub functioning in just five days after being handed the keys, and after a long period of closure. Was in there yesterday, it was well populated with a good mixture of customers including a family group playing games. Two real ales on tap, Green King IPA and Abbot Ale. I can vouch that the IPA I had was as fine a pint as you'll drink anywhere. There's also a BBQ in the garden on Sunday and free bar snacks. All round, a bit of a top lunchtime experience. Get down there, and tell Sue I sent ya. Originally the Kings Head, this pub has historically had many cricketing connections with Mitcham Cricket club little more than a large 6 hit away. The pub was run by former Surrey cricketer and Mitcham Vice President Burn Bullock until his death in the 50�s and the pub was named in his honour in the 70�s. The Association of Cricket Umpires was also formed here. Unfortunately the bails came off the pub many years ago and there have been many forced closures in recent years due to anti-social behaviour, most recently in September when the pub was forced to shut for a month � whether it is now open again I have no idea and I�m not in any hurry to find out. The fact that there is little quality competition nearby means that it has not had to set its standards very high to compete with its neighbours and that was certainly evident on my one and only visit after a match at nearby Tooting & Mitcham. The interior is a large knocked through L-Shape with a dark and dingy feel to it. The multi-screens, fed a diet of Premiership football to a small but vocally aggressive sounding customer base although to be fair it was probably no worse than I have encountered in many similar pubs but, whilst I didn�t feel personally intimidated, I can imagine what the place would be like had I stayed for longer than necessary. Of the 3 handpumps, no ales were available (Speckled Hen and Broadside were the options with 1 pump unclipped) which displayed poor management given that this was early on a Saturday night however I suspect that there aren�t too many ale drinkers that would frequent the place enough to be particularly bothered. Not really much else to say about the place other than I don�t give it too many recommendations and I would expect it to become a full time victim of Britain�s closed pubs problem very soon if it hasn�t already done so. this place is a step down from the cricketers.